Jess Lawson, a forty-five-year-old healthcare consultant, wife, and mother of two, has spent most of her adulthood fostering the illusion of having a perfect life. Her impending empty-nest syndrome as her youngest child prepares to start college is troubling enough, but when her doctor husband, Arthur, announces his intention to take a prestigious new job on the other side of the country—and relocate with-out Jess—her world quickly crumbles. Amid their acrimonious divorce, revelations about Arthur’s infidelity come to light; and at work, instead of the revitalized career Jess is hoping for, she uncovers surprising financial corruption that threatens a scandal for her client—and the well-being of the many unsuspecting patients and physicians they serve. Ultimately, this superwoman is forced to acknowledge that her put-together veneer can’t hold up under the weight of these new burdens. She also, however, refuses to wallow in victimhood. So what now? A smart, relatable story for every woman who’s gone bold to sort out her next chapter, A Better Next shows how—with a little soul searching and a supportive circle of friends and colleagues—it’s possible to redefine happiness and establish a liberating, new normal at any stage of life. In A Better Next, Maren Cooper has created memorable characters, especially in Jess, a smart, strong, and savvy hospital consultant who is blindsided by her husband’s affair. The situation may be universal but the story is unique, making for a page-turner tribute to friendships and families. Take a woman determined to move on from a failed marriage, give her the support of loyal women friends, and plunge her into a morally challenging high-level business merger: now that’s a story that will keep you turning the pages late into the night! 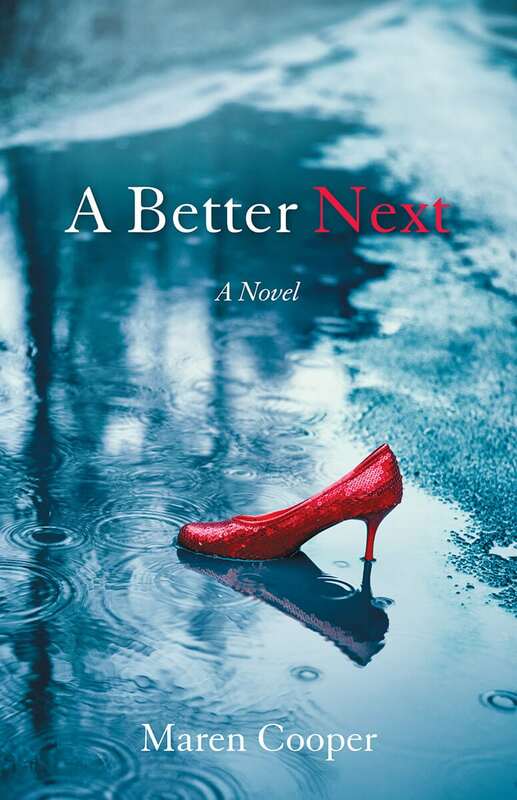 A Better Next is Maren Cooper’s touching debut detailing one woman’s journey through divorce and professional challenge. Jess Lawson is devoted to her family and its veneer of perfection, but in her preoccupation with work, she fails to acknowledge her disintegrating marriage. This novel explores healing, recovery, and the satisfaction one gains from enduring friendships. Featuring a strong female protagonist who takes charge of her life, A Better Next would be a fitting and meaningful read for those entering new chapters in their lives. Both sprightly and deeply felt, A Better Next captures the losses, trade-offs and rewards of the contemporary career woman/wife/mother. Many are the women who will recognize themselves in Jess’ story. Jess Lawson is an expert multi-tasker, successfully juggling marriage, family, and career. Yet when her husband announces that he’s through, things threaten to spin out of control. Can she hang on, restore balance, and put everything right? Or must she accept what she can’t control? Maren Cooper’s debut novel takes the reader on Jess’s personal journey with skill, compassion, and insight. A Better Next is a lovely read.